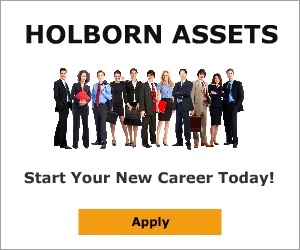 Mar 27, 2017 Holborn Assets is a leading Global Financial Services company headquartered in Dubai and variously regulated by the FCA in the UK, the FSB in South Africa and the Insurance Authority of Dubai, UAE. Currently it employs circa 350 people and services 15,000 very happy clients with high quality advice and service, a responsibility it does not take lightly. Its mission is to put ‘The Right Money, in The Right Place at The Right Time with Integrity and Respect for all’ and they have built an enviable reputation over nearly 20 years of operations by ensuring their consultants are qualified, experienced and meet their exacting standards. From the International Service Center in Colombo they strive hard to provide first class client servicing from a 60+ strong team providing monthly valuations, quarterly portfolio reports and customer newsletters. Historical performance is not indicative of future results and as such investments can go up aswell as down, in circumstances where clients feel they have fallen short of their own exacting standards there is a robust complaints procedure and where they are found wanting they will ensure clients are recompensed. This is not a customer of Holborn. Review #1022810 is a subjective opinion of User1022810.